In this guide you can find information about recording an audio and a video stream with an IP camera into MPEG-4 file format. To implement this example, you need to have OZEKI Camera SDK installed, and a reference to OzekiSDK.dll should be added to your Visual Studio project. How to record audio and video stream with an IP camera device using C#? 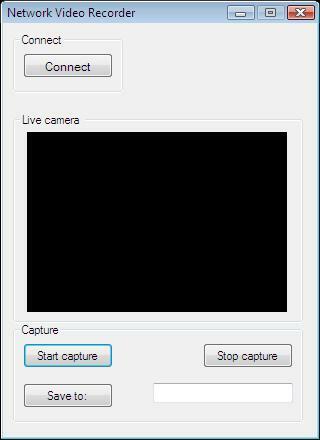 Button_CaptureVideoStart_Click(): initializes the path variable that is used to determine the destination folder of the captured video. Then calls the StartVideoCapture() method with this parameter. StartVideoCapture(): creates a string that contains the actual date and time then uses its parameter to complete the path. Finally, initializes the Mpeg4Recorder object, subscribes to its events and establishes the connection between the media channels and the Mpeg4Recorder object. Mpeg4Recorder_MultiplexFinished(): terminates all connections and closes the recorder object. StopVideoCapture(): calls a multiplexing method and terminates the connections. Button_SaveTo_Click(): makes the user to be able to choose the path and saves the result into the TextBox GUI element that can be seen on the picture below. Clicking the "Start" button begins the capturing process and when you push the "Stop" button the process ends. The interval of the captured video will be the interval between the two button hits. If the TextBox GUI element is empty, there will be no path where we could save the captured video so we will save it to the source folder where the application has been started from. You should add the System.Drawing.dll, the System.Windows.Forms.dll and the OzekiSDK.dll to the references of the solution.